FILE - A private security guard helps a wounded woman outside the Maalbeek metro station in Brussels after a blast there March 22, 2016. The prime minister acknowledged security lapses but defended anti-terror efforts. Belgium's prime minister says life is returning to normal, after the suicide attacks on the Brussels' airport and metro that killed 32 people and wounded dozens of others. 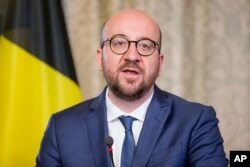 Speaking with reporters in Belgium’s capital, Charles Michel admitted his country has made mistakes in combating violent extremism, but he rejected criticism it has become Europe's weakest state in efforts to eradicate terrorist threats. FILE - Belgian Prime Minister Charles Michel says Belgium has had 'great successes' in combating terrorism. The March 22 attacks in Brussels were the deadliest since World War II. "When there is an attack like that, of course that's a failure and nobody can deny this," the prime minister said. "I cannot accept the idea that we're a failed state." But, in the fight against terrorism, "everywhere in the world and in Europe, there have been successes and there have been failures," he stressed. Michel said Belgium has had "great successes," having "prevented many attacks" and securing scores of convictions on terrorism-related charges. "If we were weak, then we would not have been able to convict 100 persons on terrorism issues," he said. He also referred to the 9/11 attacks on the United States, saying it took a decade to find the mastermind behind them even "with all the police in the world searching." Osama bin Laden was found in a Pakistani compound and killed there by U.S. Special Forces in May 2011. Roughly 3,000 people died in attacks of September 11, 2001, when hijackers crashed planes in New York’s World Trade Center, at the Pentagon near Washington and in a field in Pennsylvania. Investigators discovered links between assailants in the Brussels attack two weeks ago and those behind the Paris attacks last November 13, all claimed by the Islamic State extremist group.